In honor of the Fourth of July (exactly one week from today!!!!) here’s a fun and casual look, perfect to wear to a BBQ or a firework show! You could also wear it with shorter shorts (these are my current favorite!). 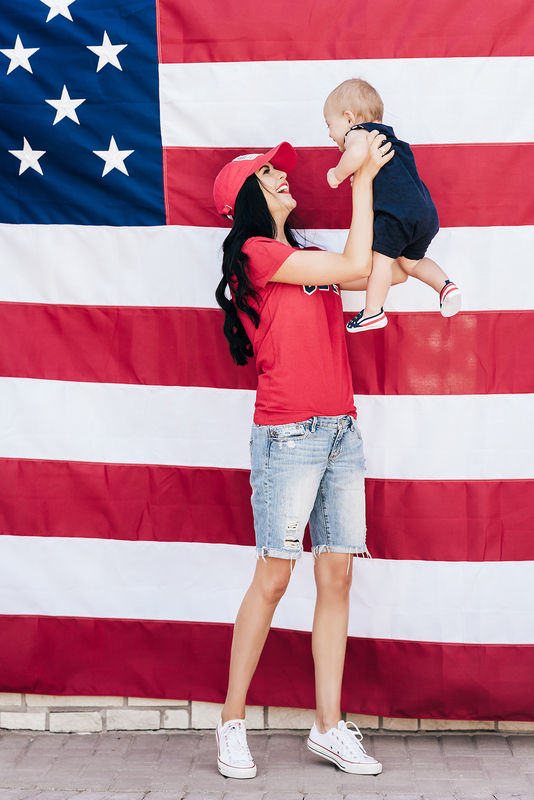 Be sure to keep reading my blog this week because I’ll be sharing more outfit ideas to wear to all the different festivities leading up to the Fourth of July! Thanks so much for stopping by, I hope you all have a great Tuesday! Such a cute look for both of you. Jackson’s little shoes are the cutest. Looking super cute! Lovely photos! Love the bermuda shorts! I haven’t seen those in years, but they look great with that outfit. A great casual but pulled together look. This outfit is so patriotic! So cute! Your some is adorable! What a patriotic duo! Happy almost 4th! Jackson’s little outfit is SO cute! Love his little shoes! He’s so adorable! Love your matching fits! Thank you, Briana! Dash is a trooper and deserves the best dog award! How cute are you?! LOVE the longer shorts – need to bring those back! Love this outfit for the 4th! Casual, but cute and patriotic. The Bermuda shorts and Gap-like t shirt takes me back to the 90s! Such an adorable look, you look great in red! Rach, this is fabulous! You are the epitome of class and I love how you incorporate your gorgeous family into your blog posts. I am such a huge fan :) thank you for constantly inspiring me and my fashion sense! It would mean everything to me if you could check out my fashion blog! Thank you so much, Paige!! What a sweet thing to say! :) Love your blog!! Keep up the good work! So cute! Can you please do a tutorial on how you edit your photos? Have a safe and happy fourth! Thanks Olivia!! My photographer edits my photos, but I can totally ask her!